Langfords Furniture is a small family run bespoke cabinet making business based in Stourbridge, West Midlands. 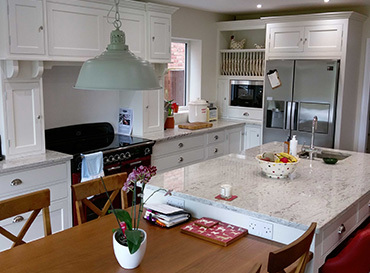 It consists of a small team of skilled cabinet makers with years of experience and a small administration office; we have no sales team therefore you will only ever reach one of the business owners or the Administration Manager giving you a more personalised service which we believe makes all the difference. All of our furniture is designed and handmade for you at our factory in Stourbridge, we keep our customers up to date with all elements of their order from your first enquiry to the fitting of your finished product. We pride ourselves on having good relationships with our customers hence the fact that we have many customers coming back to us and/or recommending friends and family members. We have a small showroom in Stourbridge, attached to our factory that showcases some of our work, you are more than welcome to come along and take a look. Completely bespoke, unique furniture; designed, constructed and fitted specifically for you. A free design and quotation service. Excellent quality and value for money that is far superior than anything you will find on the High Street. Durability, we only ever use high quality and solid materials that are built to last.